Scientific computing is the heart of the XSEDE community. Specifically, computing at a level that requires the resources of a nation. The use cases in this area describe how researchers access and use supercomputers provided by service providers who are, in turn, sponsored by U.S. government agencies, notably the National Science Foundation. 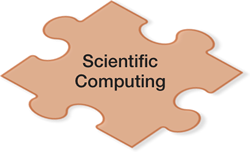 Each category in this area describes a style of computing used in research computing. These use cases describe the most common ways in which researchers use XSEDE's HPC resources. The XSEDE system has its origins in providing leading-edge high-performance computing (HPC) systems to researchers and scientists. While service providers (SPs) design, construct, and operate the HPC resources themselves, the XSEDE system smooths the way for researchers by providing a system-wide website, documentation, registration and account management services, the XSEDE allocation system, and tools to help move code and data into and out of individual resources. These use cases describe the most common ways that researchers use XSEDE's high-throughput computing (HTC) resources. Also known as "capacity computing," high-throughput computing allows researchers to run a very large number of modeling, simulation, or data analysis tasks in a short amount of time. The resources required by each task can be small (similar to what one could run on a basic computer) or very large (requiring more active memory or CPU cycles than "normal" computers provide). What makes HTC unique is the fact that many runs of the same code are required to complete a research project. XSEDE's HTC resources allow researchers to complete projects faster than they could if they were limited to the computers available in their own offices, labs, or research institutions. These use cases describe the typical XSEDE user needs in the Infrastructure-as-a-Service (IaaS or "cloud") area. IAAS-1 through IAAS-4 describe how XSEDE IaaS services are used by end users. IAAS-5 through IAAS-7 describe how XSEDE IaaS services are shared within a research community with shared computing needs. IAAS-8 and IAAS-9 describes how an application or science gateway developer can automate use of XSEDE IaaS services via a software API. These use cases describe how researchers can complete a large--and sometimes intricately complex--set of computing tasks required by their research on XSEDE resources. Data-intensive research is becoming increasingly common, and novel research problems require many data processing tasks to assemble the right data, put it into forms suitable for advanced analysis techniques, and convert the resulting output into useful forms for answering research questions. It's important to automate these tasks in order to complete research projects in a practical amount of time without distracting researchers from their day-to-day work. "Scientific workflow" is the term most commonly used to describe this style of work.